It took six years for Mohd Azizulhasni Awang, 28, to clinch the Bronze medal in the Keirin cycling event at the Rio Olympics 2016. It did not come easy. There were numerous battles and sacrifices to be made before he could attain that medal. For example, while competing in the Track World Cup Keirin event in February 2011, the Pocket Rocketman had to power through to the end of the finish line with a 20cm splinter of Siberian wood stuck in his calve. The pictures of him in excruciating pain at the end of the race is a reminder that one does not arrive at the Olympic podium without wounds. All the pain, hard work and sacrifices that Azizulhasni endured transmuted into Malaysia’s first Olympic medal in track cycling and Yayasan Sime Darby (YSD) was behind him all the way. The Foundation began sponsoring Azizulhasni, along with seven other track cyclists, in 2010, with an initial commitment of RM2 million towards honing their talent under national track cycling coach John Beasley. Azizulhasni was also awarded a scholarship to pursue his higher education in Victoria University, Melbourne. The sponsorship falls under YSD’s Youth & Sports pillar, which focuses on the support and promotion of sporting activities to help develop talent by creating an opportunity for youths to fulfill their full potential. By doing so, YSD also aims to elevate the standards of various sports in the country. Out of the seven track cyclists, Azizulhasni and Fatehah Mustapa qualified to compete in the London 2012 Olympics, with Azizulhasni competing in the final round of the Keirin event. 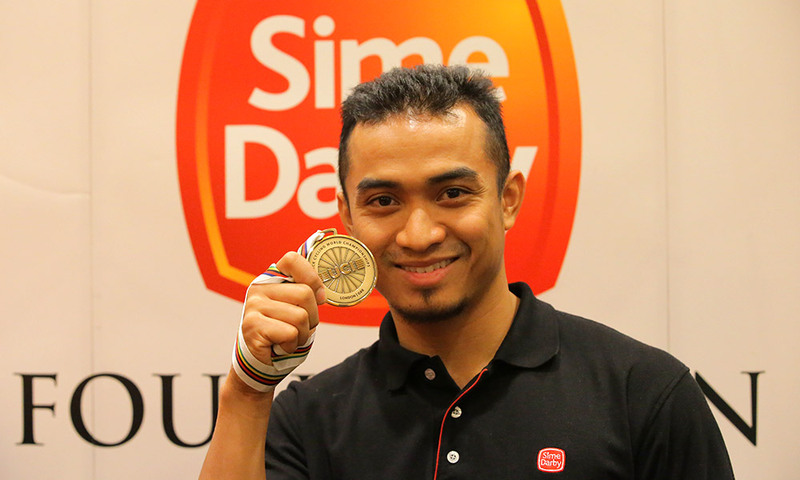 Due to their high potential towards clinching a Gold medal in the Olympics, Yayasan Sime Darby decided to continue support for Azizulhasni and Fatehah en route to Rio 2016 Olympics, committing RM2.85 million towards the duo. Both national athletes have come a long way since 2010 when they were junior track cyclists. They have become proud national flag bearers and stand as an example to all young people to keep their noses to the grindstone and to never give up in the face of challenges.